The race for US presidency in next year’s election is likely to see a Hindu representative and a senator of part-Indian-American descent vying for the Democratic Party’s nomination, reports The Statesman. Tulsi Gabbard, 37, the first Hindu elected to the US Congress, announced on Friday that she will be running for president. Kamala Harris, 54, who is of Indian and African-Jamaican descent and is identified as a member of the Christian Baptist sect, is expected to announce her candidature for the Democratic Party nomination next week, according to several news reports quoting sources close to her. Adding to the mix, there is speculation that Nikki Haley, who quit as US Permanent Representative to the UN at the end of last year may seek the Republican Party nomination in the event that President Donald Trump is not up for re-election next year. The former South Carolina Governor was the first Indian American to be a member of the US cabinet and has received some Republican Party grassroots support for a 2024 run. 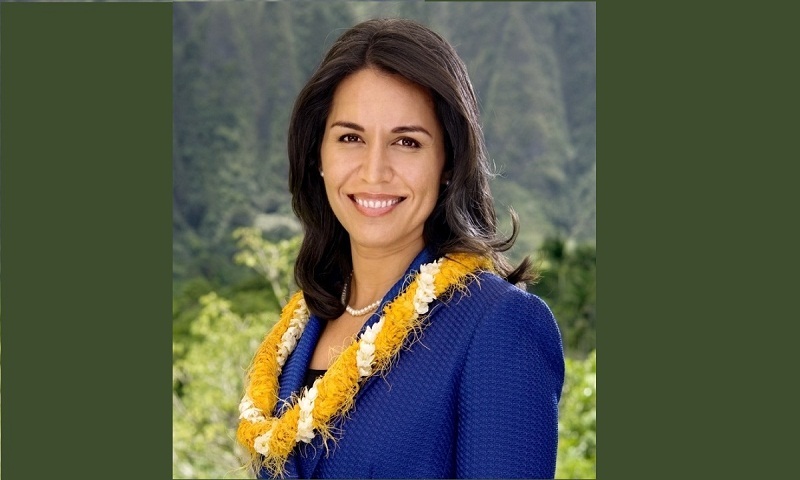 Gabbard is not of Indian descent but comes from a Hindu family in Hawaii and took her oath office on the Bhagavad Gita when she was first elected to the House of Representatives in 2011 and after her three re-elections. She continues to be a member of the Army National Guard with the rank of major and while serving in Congress has been mobilised for emergency duties. Despite – or because of – her military background, she has opposed US involvement in Syria and faced criticism for visiting that country and meeting President Bashar al-Assad. Gabbard has been a strong supporter of India and closer US-India ties as well as of Prime Minister Narendra Modi. She has advocated cutting US aid to Pakistan and pressuring it to end its support international terrorism. But this year she harshly criticised Trump for not taking a strong stand against Saudi Arabia for the killing of Washington Post columnist Jamal Khashoggi. She is on the populist left in the Democratic Party and supported Bernie Sanders, the maverick progressive senator, for the party’s nomination in 2016. She accused the party leadership of being partial to former Secretary of State Hillary Clinton and against Sanders and resigned as a vice president of the party. Sanders himself may run for the party nomination and another candidate from the party’s left, Massachusetts Senator Elizabeth Warren, has announced her candidature. Former Vice President Joe Biden, who comes from the party’s centrist wing, is also likely to join the fray. Gabbard, who was elected to Hawaii state legislature when she was only 21, is the youngest person running for the presidency so far for 2020. She had a run-in with Harris this week, accusing her of religious bigotry for her opposition to a nominee for federal judgeship because he belonged to a Catholic organisation called the Knights of Columbus. “While I oppose the nomination of Brian Buescher to the US District Court in Nebraska, I stand strongly against those who are fomenting religious bigotry, citing as disqualifiers Buescher’s Catholicism and his affiliation with the Knights of Columbus,” Gabbard wrote in a newspaper op-ed.